TWIN LAKES: AUTUMN FIRES burns bright. The story settles over you like an October mist, burrows under your skin, carving ancient symbols into your flesh. 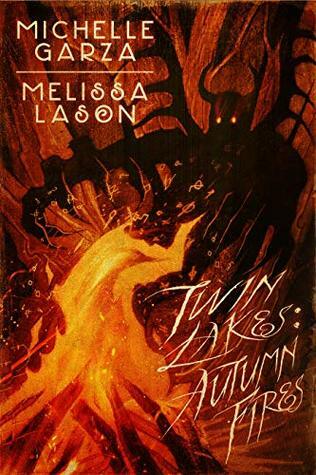 TWIN LAKES: AUTUMN FIRES is a refreshing horror read. October is the perfect month to read this one. I loved MAYAN BLUE. If you haven’t read it, then you should remedy that quick like. When you hear the Sister’s of Slaughter have a new one coming out, you move it to the top of the TBR pile. It’s just what you do. Just look at the cover, guys! I want to frame it and put it on my wall. TWIN LAKES: AUTUMN FIRES is set in the Pacific Northwest in Twin Lakes, Washington. Liz hitches a ride from a stranger. Things go terribly wrong. The stranger turns out to be a predator. Liz barely escapes. She runs for her life towards a soft glow in distance. She stumbles upon a grotesque murder. As the flames flicker and cast shadows about, she becomes the killer’s prey. As you can already tell, TWIN LAKES: AUTUMN FIRES is a fast-paced story just the way I like it. That isn’t the only murders, either. Twin Lakes is a picturesque town with secrets aplenty. There is a serial killer lurking about. Twin Lakes is filled with werewolves, witches, the occult, and monsters. What’s not to like about that? The townsfolk keep everything hush-hush, so no other agencies get involved. Can the locals contain the situation? You’ll have to read it to find out. Michelle and Melissa’s spellbinding prose makes for an excellent reading experience. TWIN LAKES: AUTUMN FIRES makes me want to live deliciously. I read it in one sitting. I loved the mystery, the characters, and the reveal. I could live in Twin Lakes. I hope the Sisters of Slaughter revisit Twin Lakes.